I like being a scientist – studying nature, trying to work out how things work, and hopefully having my work make the world a better place, in one way or another. However, it can be hard work. Lab experiments have to be painstakingly thought out, sources of error and bias minimised, and any assumptions noted. When writing papers you have to communicate clearly and precisely, use scientific language and statistics accurately and avoid exaggeration. Citations of other people’s work have to be accurate which means having to thoroughly read the research journals. Sometimes, I’d much rather be a pseudoscientist. It must be so much easier to slap together experiments that only seek to prove what I want them to. I could ignore bias, good statistical analysis and intellectual integrity. I could play fast and loose with scientific terminology and throw in words like “quantum”, “resonance” and “multiplasmic fendangles” when I want to sound “sciency”. I wouldn’t have to read papers carefully, I could just cherry pick out only phrases that could be twisted to suit my argument. And when I get challenged all I would have to do is say “There’s more to life than science!” Life would be so easy. I even have an idea that would benefit me financially. After all if people are gullible enough to put strips of plastic around their wrists and think it will improve their balance, then they’ll buy anything, even my Homeopathic Activity Verifier (HAV). The Homeopathic Activity Verifier (TM) uses patented Quantum Unified Attentuating Cathode (QUAC) technology to test the effectiveness of homeopathic solutions. Utilising Carbon Resonating Alpha Particles (CRAP) circuitry this device is cutting edge technology. Just place the solution in front of the device, press the button and the lights will activate when it detects the altered resonance harmonics of the energised water particles. 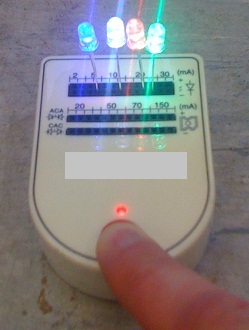 If only several of the lights activate the solution may have degraded due to exposure to light or a skeptical presence. The usefulness of the HAV device has been independently verified (paid advertisement) in both the International Journal of Dodgy Gadgets (2011) pg 102 and the Australian Womens Weekly. The patented QUAC technology is supported by the recent work of Nobel Laureates, Frank Lee Bonkers and Ima Nutter. Phone now and you will receive a free gift of either a set of dowsing rods or a glass hammer. When is it coming out? Will it detect the effect of vaccines on my UFO perception? Can it be affected by my aura? Nice. Poe to the maximum! Unlikely. Only the negative polarity of a skeptics dissonant aura is likely to interfere with the coherent energy flux of the HAV. The scary thing is that this stuff is almost too easy. If I could just discard my ethics and respect for the scientific method, I could make a mint. Will it test my homeopathetic sleeping meds, i took the whole bottle and it is doing nothing for me. Jennifer M, homeopathic medicines become more powerful the more dilute they are, so by taking the whole bottle, you’ve under-dosed. That’s why they’re having no effect. Tomorrow evening, when the underdose has worn off, try not taking any. That should send you right off to sleep. No, wait… not taking any will be an infinitely powerful dose. You might never wake up! Maybe just take 1 to be on the safe side. Oh wow! As soon as I posted my previous comment, it was marked “Duncan Pierce, 23 hours ago”. Maybe the picture of the HAV on your website is creating some kind of quantum time-dilation effect. When the HAV I’ve ordered arrives, do I have to worry about inadvertently altering the past when I use it? I don’t want to end up marrying my own grandmother or something like that. If that happens can I get a refund? Pseudoscientist, what really their job is ? I’m like you Michael, I always miss these great opportunities. Back in the late 80s I was reading an article on colour therapy and I suggested to my wife that we started our own money printing business – ‘smell-o-therapy’. We decided nobody would buy it. Bad decision, within the year aromatherapy emerged – all we needed was better marketing. And now, 25 years later I’m stuck trying to develop biotech devices using good engineering and good science and it’s so damned hard. Does anyone know if this HAV gadget is SAFE? The Large Hadron Collider uses those quantum things. Even my 5 year old knows it’s always creating black holes. It makes me sick how scientists can play God about the annihilation of the galaxy! Before I order, I want to know has anyone else tried this? If I accidentally annihilated the galaxy I don’t think I could look my neighbours in the eye. I’m starting to see why some scientists cross to the “dark side”. It is just too easy and fun to make up this sort of woo. I could start working on an earthquake neutraliser for Christchurch (talk about a captive market). Maybe using crystals (pseudoscience love crystals, its sooo new age). Perhaps using Synchronised Ultrasonic Crystal Kinetic Earthquake Reduction (SUCKER) technology to set up an antigravitational wave? Perhaps I could even get the Moon Man for a “celebrity” endorsement? I appreciate your concerns. I’ll try telepathically contacting the Xanyli aliens who gave me the design the next time their UFO is in range. I think some galaxies were annihilated with an earlier design but they have since worked out the bugs. The present record in this topic is half a dozen of prizes, including 1 Academic Awards and 1 Nobel Prize. If you improve your QUAC circuitry on Deep Thought platfrom, surely you’ll get something more. Hot necessarily. An lot of organics do not ionise in water and thus the conductivity can still be very low. I reckon dehydrated water is the way to go. We could save millions on freight costs. Ship the bottle with the active grains in the bottom and….simply…add water to the top. ….now rests on laurels and heaps of money. On the other hand, watching strips of waste superconducting tape go into the bin has tempted a few of us to make some money for a charity by flogging them off as superconducting holographic John Key bangles. Michael, you’re so kind. When you contact the Xanyli can you ask them what’s happened to my levitation crystals? I can’t find them anywhere. There are too many fake homeopathic meds being sold on the internet! With the HAV I can check I’m not being ripped off!! Thanks Michael!